I had a box of puff pastry in my freezer and since I am totally out of all kinds of flour (except for chickpea flour) baking has kind of been out of the question. Anyway, I decided to experiment with this yesterday. 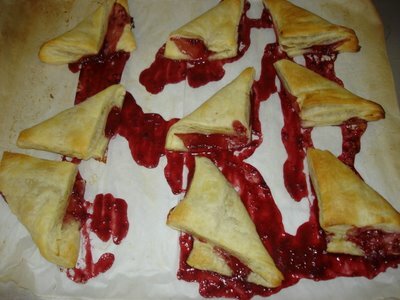 I just cut it into squares, put a dollop of raspberry jam in the middle and then folded the pastry into triangles. These were sinfully delicious. Honestly it was far too easy to eat 8 at a time. these look amazing...I just love puff pastry! mmm...I'm thinking about cherry pie filling...that would be great too. This will sound silly but yum yum yum! I've also been guilty of the puff pastry in freezer for months. Cherry pie filling would be great Megan! Jess, I think there is probably less guilt leaving the puff pastry in the freezer than eating a whole box of it yourself! LOL! Do either of you have any tips for getting the stuff to stay inside? As you can see mine seem to blurt out everywhere! That looks scrumptious! I'll have 1, 2, 3... 8 as well! !